Leatherman has been making tools for 30 years. According to their website, "After spending his childhood in Oregon, Tim Leatherman stayed local and received his Bachelor of Science in Mechanical Engineering from Oregon State University. Time spent traveling abroad - which included staying at hostels and driving an untrustworthy $300 Fiat - convinced Tim of the need for a pliers based, multi-purpose tool. "I was carrying an old Boy Scout-type knife and used it for everything from slicing bread to making adjustments to the car. But I kept wishing I had a pair of pliers!" Thus the creations of great multi-tools began. But they didn't stop there! They knew there was a market to those young enthusiasts, the 8-12 year old range who are into the outdoors. 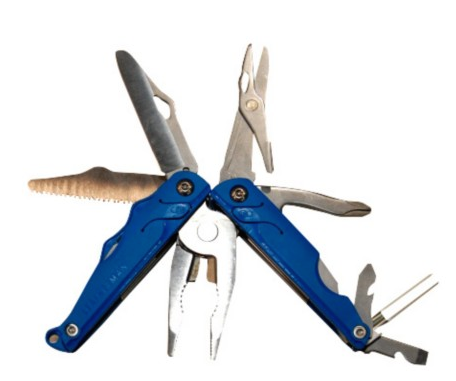 They've recently created the Leatherman Leap Multi-Tool for the beginner. It's a little less daunting than their normal multi-tool, and steps above the 'ole swiss army knife days. What we love and know parents will enjoy is that the knife blade actually comes unassembled. So when you purchase the tool it's not installed. When you decide your child is ready for that, then you install the knife blade. It's a one-time install and it's in forever. There are also some new safety locks and features that were made with more of a child/tween in mind. It also comes in blue, red, and green depending on preference alone. The Leap is going to be the next big thing for the young outdoor adventurer. Since it's fresh to hit the market, get ahead of the game and get yours, today!